Greetings and blessings to every one of my friends. What is the real, spiritual meaning of crisis? Crisis is an attempt of nature to effect change through the cosmic lawfulness of the universe. If change is obstructed by the ego, the part of the consciousness that directs the will, crisis will occur to make structural change possible. Without such structural change in the entity, no balance can be attained. Every crisis ultimately means such a readjustment, whether it appears in the form of pain, difficulties, upheaval, uncertainty, or merely the insecurity that comes from starting out on unaccustomed ways of living after giving up a familiar one. Crisis in any form attempts to break down old structures based on false conclusions and therefore on negativity. Crisis shakes loose ingrained, frozen habits so that new growth becomes possible. It tears down and breaks up, which is momentarily painful, but transformation is unthinkable without it. The more painful a crisis is, the more the will-directing part of consciousness must attempt to obstruct the change. Crisis is necessary because human negativity is a stagnant mass that needs to be shaken up in order to be let go of. 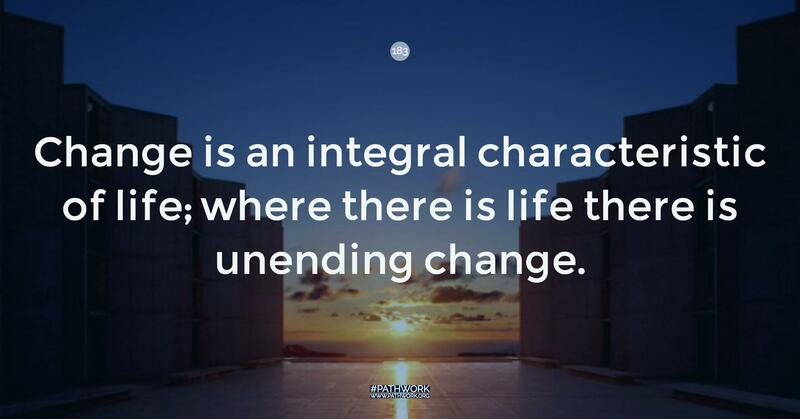 Change is an integral characteristic of life; where there is life there is unending change. Only those who still live in fear and negativity, who resist change, perceive change as something that ought to be resisted. They resist life itself, and suffering closes in on them more tightly. This happens in people’s overall development as well as in specific instances. Human beings can be free and healthy in areas where they do not resist change. There they are in harmony with the universal movement. They constantly grow and experience life as deeply satisfying. Yet these same individuals react entirely differently in areas where they have blocks. They fearfully cling to unchanging conditions inside and outside themselves. Where they don’t resist, their lives will be relatively free from crises; in the areas where they do resist change, crises are unavoidable. The function of human growth is to free one’s inherent potentials, which are truly infinite. However, where negative attitudes stagnate, realizing these potentials is impossible. Only crisis can tear down a structure that is built on premises which contradict the laws of cosmic truth, love, and bliss. Crisis shakes up the frozen state, which is always negative. On the path to emotional and spiritual fulfillment you need to work intensively in order to free yourself from your negativities. What are they? The misconceptions; the destructive emotions, attitudes and behavior patterns that arise from them; the pretenses and the defenses. But none of these would present too much difficulty in themselves if it were not for the self-perpetuating force that compounds each negative aspect in an ever-increasing momentum within the human psyche. All thoughts and feelings are energy currents. Energy is a force that increases with its own momentum, always based on the nature of the consciousness that nourishes and directs the energy current in question. Hence, if the underlying concepts and feelings accord with truth and are therefore positive, the self-perpetuating momentum of the energy current will increase ad infinitum the expressions and attitudes implicit in the underlying thoughts. If the underlying concepts and feelings are founded on error and are therefore negative, the self-perpetuating momentum of the energy current will compound, though not ad infinitum. For example, you know that misconceptions create behavior patterns that inevitably seem to prove the correctness of the assumption, so that the destructive, defensive behavior will become more firmly entrenched in the soul substance. All of you on the path have battled such inner entanglements. The same principle applies to feelings. For example, fear could easily be overcome if it were challenged and its underlying misunderstanding and mishandling exposed. Many times manifest emotions are not direct primary emotions: fear may disguise rage; depression may disguise fear. The problem is that fear creates more fear of facing and of transcending itself. Then one fears this fear of fear and so on. The fear compounds. Let us take depression. If the underlying causes of the original feeling of depression are not courageously exposed, you become depressed about being depressed. You may then feel that you should be able to face your depression rather than being depressed about it, but you are not really willing—and therefore not able—to do so, and that depresses you even more. This becomes a vicious circle. The first depression—or fear, or another emotion—is the first crisis that is not heeded nor is its true meaning understood. It is evaded, so that depression about being depressed will be set off in the self-perpetuating vicious circle. The consciousness of the person becomes more and more removed from the original feeling and therefore removed from itself, making it more difficult to find the original feeling. The increased negative momentum finally leads to a breakdown of the negative self-perpetuation. Contrary to truth, love, and beauty, which are infinite divine attributes, distortion and negativity are never infinite. They come to an end when the pressure bursts. This is a painful crisis, and people usually resist it with all their might. But imagine if the universe were created differently and negative self-perpetuation continued ad infinitum. It could mean eternal hell. The negative self-perpetuating principle is most obvious in the case of frustration and anger. Many people can see relatively easily that the frustration itself is less difficult to bear than their frustration at being frustrated. The same is true of anger at oneself for being angry or being impatient with one’s impatience, wishing that one could react differently and not being able to do so because the underlying causes are not exposed and faced up to. Thus the “crises” of emotions such as anger, frustration, impatience, and depression are not recognized for what they are. This makes the negative self-perpetuation stronger and stronger, until the inflamed boil bursts. Then we have an obvious crisis. Crisis can mean, if one’s consciousness so chooses, the end of continually swelling negative self-perpetuation. When eruption comes, the choices of recognizing the meaning or continuing to escape become more clearly defined. Even if this eruption does not lead to recognition and an inner change of direction, a final crisis is bound to come where the entity can no longer take refuge from its message. The personality must see eventually that all eruptions, breakdowns, crises, mean to tear down the old structure so as to reerect a new and better functioning one. The “dark night” of the mystics is such a time of the breakdown of old structures. Most human beings still fail to understand the meaning of crisis. They continually look in the wrong direction. If nothing would break down, the negativity would continue. Yet it is possible after a certain amount of awakening has taken place in the consciousness that the person does not allow the negativity to become too firmly entrenched. Thus the negativity is prevented from starting the self-perpetuating cycle. It is confronted right at the start. Crisis can be avoided by looking at the inner truth when the first inklings of disturbance and negativity manifest on the surface. But a tremendous amount of honesty is required to challenge one’s tightly cherished convictions. Such challenge cuts out the negative self-perpetuation, the motor force that compounds the destructive, erroneous psychic matter until it finds a breaking point. It avoids the many vicious circles within the human psyche and in relationships that are painful and problematic. If difficulties, upheavals, and pain in the individual’s life, as well as in the life of humanity as a whole, were viewed from this point of view, the real meaning of crisis would be understood and much pain could be avoided. I say to you now: Do not wait for crisis to come in an eruption as the natural, balance-establishing event that takes place as inexorably as a thunderstorm must take place when certain atmospheric conditions have to be altered and clarity in the atmosphere is to be re-established. This is exactly what happens within the human consciousness. Growth is indeed possible without intense painful “dark nights,” if honesty with the self becomes predominant in the personality. True inner looking and deep concern with the inner being as well as giving up pet attitudes and ideas must be cultivated. Then the painful, disruptive crisis can be avoided, because no inflamed boil will form. The process of death itself is such a crisis. I have discussed various deeper meanings of death. This is yet another. Superficial death—and it is nothing else but that—could be avoided if crisis were not allowed to swell to an eruptive boil, but dissolved voluntarily with the available consciousness. Superficial death of the human body takes place because the consciousness says, “I cannot go on any longer,” or “I am at my wit’s end.” Any crisis contains this thought. Consciousness always expresses to itself, “I can no longer deal with the situation.” If the situation is specific, a specific crisis occurs in life. If it is a question of one’s present incarnation as a whole, then physical death will occur. In the latter case, the eruption takes the form of the spirit’s breaking out of the body, until it finds new life circumstances in which to deal with the same inner distortions all over again. Since eruption, breakdown, and crisis always aim at discontinuing old ways of operating and creating new ones, the process of death and rebirth signifies the identical principle. People tend to oppose going on to other ways of operating and reacting, however. This obstruction is so unnecessary. It is actually this opposition that creates the tension and strain of crisis, not the giving up of the old structure itself. When necessary change is not accepted willingly, you automatically put yourself into a state of crisis. The intensity of the crisis indicates the intensity of the opposition, as well as the urgency of the need for change. The greater the need for change, and the greater the obstruction to change, the more painful the crisis is going to be. The more openness and willingness there is, on any level, to change, and the less necessary the change is at any given moment of the evolutionary path of an individual, the less severe and painful the crisis is going to be. The severity and pain of a crisis is by no means determined by the objective event. I think most of you, my friends, can readily verify this. Most of you have gone through severe changes outwardly. You have lost a loved one, you may have coped with the most drastic changes and objectively traumatic events—wars, revolution, loss of fortune and home, illness. Yet you may inwardly have been much less agitated and in pain than in situations which are outwardly incommensurate with the agitation of your inner feelings. Thus we can say that an outer crisis may leave you inwardly in greater peace than an inner one. The objectively more traumatic event hurts sometimes less than the objectively less traumatic one. In the former instance the necessary change takes place on an outer level, which your inner being accepts more, adjusts to better, and finds a new way of dealing with. In the latter instance, the need for inner change meets with greater resistance. Your subjective interpretation of the event makes the crisis disproportionately painful. Sometimes one tries to find rational explanations for such a peculiar emotional intensity—explanations which can be called rationalizations. Sometimes both inner and outer changes and crises meet the same inner attitude. When the process of the crisis is accepted and no longer obstructed, when one goes with it, instead of fighting it, relief will come comparatively quickly. Once the pus runs out of the boil and the attitudes are adjusted, self-revelation brings peace; understanding brings new energy and aliveness. The healing process is at work, even while the boil erupts. The negation of this process, the inner attitude that says, “I should not have to go through this. Do I have to? This and that and the other is wrong with others. If it were not, I would not have to go through this now,” prolongs the agony. This attitude seeks to avoid the necessary eruption of the boil, which consists of a painful entanglement of ever-increasing negative energy whose momentum makes it more and more difficult to alter the course. The ongoing negative cycle and its futile, automatic repetition that the consciousness is unable to stop generates hopelessness. The repetition and the hopelessness could stop only by no longer avoiding the necessary change. Every negative experience, every pain, is the result of a wrong idea. A critical aspect of this work is the articulation of these ideas. And yet, how often all of you still miss the necessary recognition by not keeping these incontrovertible facts in mind when you meet with an unhappy situation? Once you take on the habit of first questioning your hidden wrong assumptions and destructive reactions when anything unwelcome comes your way, and fully open to truth and change, your life will alter drastically. Pain will become proportionately less frequent, and joy will become more and more the natural state. Crisis becomes superfluous; therefore, death eventually becomes superfluous. This may sound like an extreme statement especially to those who are still awed by the mystery of death—which is also that of life—but it is nevertheless true. The rhythm of growth can then proceed smoothly, without the leaps and bounds of breaking up negative structures in the soul substance. We have discussed the negative aspects of self-perpetuation. Of course, it exists primarily on the positive side. Let us look at love. The more you love, the more you can produce genuine love feelings without impoverishing yourself and others. You realize that you do not take away anything from anyone by giving out. On the contrary, more will come to you and others from it. You will find new ways, deeper ways, more variations of experiencing love in giving and receiving it, being in tune with this universal feeling. The ability to experience and express love will grow in an ever-increasing, self-perpetuating, motion. So it is with every other constructive feeling and attitude. The more meaningful, constructive, fulfilled, and joyous your life is, the more of these attributes it must generate. It is an ongoing, never-ending process of steady expansion and self-expression. The principle is exactly the same as that of the negative self-perpetuation. The only difference is that the positive process is infinite. Once you establish the contact with your innate wisdom, beauty, and joyousness and allow them to unfold, they will increase themselves. The self-perpetuation takes over once these energies are released and admitted to consciousness. The initial actualization of these powers requires effort, but once the process is flowing, it is effortless. The more you bring forth of the universal qualities, the more there will be to bring forth. Your own potentials to experience beauty, joy, pleasure, love, wisdom, and creative expression, my dearest friends, are indeed infinite. Again the words have been said, heard, registered. But how deeply do you know that this is a reality? How deeply do you believe in your innermost potential to be self-creating, to be in bliss, to live the infinite life? How much do you believe in your resources to solve all your problems? How much do you trust in the possibilities that are not yet manifest? How much do you believe it is real that new vistas of yourself can be discovered? How much do you truly believe that you can unfold qualities of peace, coupled with excitement, of serenity coupled with adventure, through which life becomes a string of beauty even though initial difficulties are still to be overcome? How much do you really believe in all this, my friends? Ask yourself this question. To the extent you pay only lip-service to this belief, you will still feel hopeless, depressed, fearful or anxious, entangled in apparently insoluble conflicts with yourself and others. This is a sign that you do not yet believe in your own infinitely expanding potential. If you do not truly believe this, my dearest ones, it is because there is something in you that you desperately hold on to. You do not wish to expose it because you do not wish to give it up or change. This applies to every single one of you here, and of course to everyone else in the world. For who has not the “dark nights” to put up with? Some have many little “dark nights” coming and going, or their “dark night” is gray. They may not be in a great crisis at any given moment, but life is gray and fluctuates comparatively little. But then there are those who have already worked their way out of this grayness. They no longer want to content themselves with comparative safety from crisis. They are willing, deep within themselves, to chance temporary upheaval for the sake of reaching a more desirable steady state. They want to realize their potential for deeper joy and self-expression. Then the “dark nights” will become more circumscribed, experienced either as fluctuating periods of upheaval and joy, or, in some lives, bunched up in stronger episodes. Utter darkness, loss, pain, and confusion alternate with heights of golden light, carrying justified hope for an eventual uninterrupted state of bliss. No matter how any one of you experiences crises, there is always a message in them for you to discover about your own life. It is up to you not to project your experiences outwardly, on others, which is always the most dangerous temptation. Or, for that matter, to project them into yourself in a self-devastating way, which avoids the issue just as much as when you project it onto others. The attitude “I am so bad, I am nothing” is always dishonest. This dishonesty has to be exposed, so that the crisis can become meaningful, whether it be small or great. If you learn eventually to take the smallest shadow of your everyday life and explore its deepest meaning, you will handle the little crises in a way that makes the swelling of the boil impossible. Hence no painful eruption is needed to destroy rotten structures. This will reveal the stark reality to you that universal life untampered is golden joyousness of ever-increasing beauty. Every smallest shadow is a crisis, for it need not be there. It is only there because of your turning away from the issue that creates crisis. So take those smallest shadows of your everyday life and ask yourself what they mean. What do you not wish to see and not wish to change? If you face this, and truly wish to face the real issue and make the necessary change, the crisis will have fulfilled its function. You will discover new dimensions of the issue that will make the sun rise, and the dark night will turn out to be the educator, the therapist that life always is once you try to understand it. Your capacity to cope with the negativity of others grows only to the extent that you can do what I explain in this lecture. How often do you sense negative feelings from others but cannot handle them because you are anxious, uncertain, and not clear about the nature of your involvement and interaction with them? At other times, you may not even sense the actual presence of hostility in others. Their subtlety and indirectness confuses you, makes you feel guilty about your instinctive responses, but you are even less able to handle the situation. This frequent occurrence is entirely due to your blindness to yourself and your resistance to change. When you project all your old negative experiences onto others, it is impossible for you to have adequate awareness of what actually goes on in the other person, and therefore you cannot deal with it. Many of you have begun to experience the magnificent change when you handle your life in this respect as you grow in your capacity to look honestly at what disturbs you within yourself and as you become willing to change. Almost inadvertently, and as if it had nothing to do with your efforts, a new gift arises in you: You see the negativity in others in a way that leaves you free, that permits you to confront them, that is effective. It has no adverse effect on you. It must, in the long run, also be beneficial for others, whenever they want it to be. When you resist change, fear grows because your innermost being knows that crisis, eruption, breakdown, are inevitable and are steadily drawing nearer. Yet you resist doing what could avoid the crisis. What I say here is the story of human life. This is where human nature is caught. The lesson must then be repeated until the illusory fear of change is exposed as an error. If crisis can be understood the way I show you here, and if you really meditate to understand your own crisis and to give up what you hold on to, and challenge the limitations you place on the particular issue, life will open up almost at once. Are there any questions before I continue with the rest of this lecture? QUESTION: I have a relationship similar to what you described. I cannot cope with this person’s angry rebellion. I know I have this trait in myself, but I still react to it negatively. I do not communicate and open up; I do not let go. Instead, I suppress it. Can you suggest what my positive response should be? ANSWER: First of all, I recommend the assertion, “Here I am in stress and pain. I am in a situation that gives me anxiety that I wish would not exist. What is the meaning of it for me?” Open up anew. Do not use the knowledge you have already gained about yourself as the answer. It may even be correct, but previous recognition can subtly serve as a barrier. You will truly have to be willing, deep inside, to let go. To see and to let it be. Here I come to the further aspect of this lecture, which will also be an answer to you. You must realize that change cannot be executed only by the ego. The willing, conscious self alone is incapable of doing it. The difficulty of changing, and the resistance to it, come to a large extent from having forgotten that you cannot do it without divine help. Thus you go from one wrong extreme to the other. One extreme is that you think you are the one who must accomplish inner transformation. Since you know deep inside that you cannot do this, that you just do not have the equipment to do it, you give up. You feel it is hopeless to make yourself change, so you do not even really try, nor do you express the concisely formulated desire to do so. You are right to believe that the capacity to change is missing when you consider yourself exclusively as the conscious, willing, ego-self. Resistance is partly an expression of avoiding the frustration of wanting something that cannot be done and must prove a disappointment. This extreme reaction takes place in the innermost layer of the human psyche. So does the opposite extreme, in which you profess the belief in higher power, or God, who is supposed to do it all for you. You remain in an absolutely passive state, waiting for it. Again, the conscious self does not try where it should. False hope and false resignation are only two sides of the same coin: absolute passivity. But the pushing ego, attempting to go beyond its own capacity, must inevitably end in the same passive state of either falsely waiting or falsely giving up hope. The pushing exhausts the self and renders it passive. These attitudes may exist simultaneously or alternately. The way to go about making a positive change is to want it; you must be willing to be in truth and to change. And you have to pray to the innermost divine functioning within your soul to make the change possible. Then you wait for the change to take place, in a trusting, confident, and patient way. This is the absolute prerequisite for change. When it does not even occur to you to assume this prayerful attitude and say, “I want to change, but my ego cannot do it. God will do it through me. I will make myself a willing, receptive channel for this to happen,” you are basically unwilling to change and/or are doubtful about the reality of the higher forces within you. This confident, patient waiting, this assurance and trust that help will come when you are utterly willing to look at the truth, can be acquired. It is not a childish attitude that wants an authority to do it for you. Quite the contrary. This approach conciliates the attitudes of adult self-responsibility that takes action by facing the self; by wanting truth and change; by the willingness to expose hidden shame; and the receptive attitude in which the ego knows its own limitations. In this receptive attitude you let God into your soul from deep within yourself. You open up for it to happen. When this attitude is adopted, change becomes a living reality for anyone and everyone. When trust and faith are lacking that the divine can actualize itself through you, it is because you have not given yourself the opportunity to experience the stark reality of these processes. You have denied yourself this experience. And since you have never experienced it, how can you trust it? Also, since you have this or that little back door, which you wish to keep in reserve, so that you still do not need to enter into life fully and committedly, you cannot experience the marvel of the reality of the Universal Spirit within yourself. Since you are not honest with life, you cannot really believe in the power of the Universal Intelligence dwelling in you at all times, which goes to work the instant you make room for it. Total commitment to it is necessary, without reservation. This commitment is the absolute prerequisite for your discovery of its reality within you. Even if you do not know what the outcome will be, whether or not God’s way will be agreeable to you, the commitment must be made. Not knowing the total answer right now is part of it. Considerations of ways that avoid full commitment keep you holding on to the old, distorted, cheating way of life, while still wanting to reach for the new, liberated, free way in which you are whole, instead of inwardly divided and racked by the pain of this division. But you cannot have it both ways. Your commitment to the Ultimate Creator must become total, applied to the most seemingly insignificant aspect of daily living and being. You must be totally committed to the truth, because then you are also committed to the Universal Spirit. If you thus commit yourself, you will let go of the old accustomed shore and float momentarily in what seems uncertainty. But you will not mind this. You will feel safer than ever before, when you were holding on to the old shore, to the false structure that must be torn down. You will soon know that there is nothing to fear. This courage has to be summoned, only to find that this is really the safest and most secure way possible to live: to expand and to vibrate in life. It actually requires no courage at all. Then, and only then, will the “dark nights” turn into instruments of light. QUESTION: This lecture is very close to where I am. I have just begun to discover the meaning of crisis. I feel I either have to take refuge somewhere or I have to ride through the storm, which I feel I am doing now. ANSWER: This recognition is very good. It touches upon the age-old alternatives of taking refuge or driving through. It is perhaps the most important question on the evolutionary path of each entity. You remain in the cycle of death and rebirth, of pain and struggle, of conflict and strife—physically as well as spiritually and psychologically—precisely because you cling to the illusion that going through can be avoided and taking refuge will do some good. Actually, taking refuge does not do any good; on the contrary, it increases the critical tension. The momentary relief is illusion of the most serious nature. It is so because the crisis inevitably comes later on, but by then is no longer connected with its source and therefore it hurts more. When you make up your mind, however, saying, “I will not take refuge, I will go through it,” the resources within the human soul will become almost instantly available. These resources remain obscure to those who still tend to take refuge. They then feel weak and do not believe in their own capacities to actualize the infinite powers of the Universal Spirit. They do not know their potential, the strength that will arise, the inspiration that will come. Only when you decide to go through and ask for help in meditation do these resources become available. Then you will sense an awakened trust that the conscious ego is not alone. It is not the only faculty available to deal with the issue. I emphasize again that a person may be oriented this way in some areas, while remaining closed and unwilling in other areas. You will experience life and yourself accordingly. It is important that you simply want to do the best you can. It is not important whether or not you make “mistakes,” whatever they may mean. The struggle itself is what counts and what must bring conciliation. The consequent blessing, strength, and growing wholeness of the personality cannot be put into words. You want “ideal solutions,” so you always agonize on the threshold of this total commitment. But what are ideal solutions? They mean nothing if they are not based on the growing wholeness of a person, which comes to pass through the process described here. I bless you and ask you to open up your innermost being, your whole soul, all your psychic forces, to let go of the cramp that denies truth and change, therefore self-expression and light. Open up in this way, to let the blessed power constantly present within you permeate your whole being. This power is strongly activated in such gatherings, when you come together, when you receive help and open up to one another for yet another channel of help. A blessing comes forth that will meet with the inner power of which I have spoken, thus doubly strengthening you. Continue your growth, in the spirit of this lecture, so that your wholeness, your connectedness with the universe, will grow and give you more of the joy that is inherently your birthright. Be blessed, be in peace.